Gary Berntsen is the Republican candidate for the US senate in New York running against incumbent Democrat Chuck Schumer. 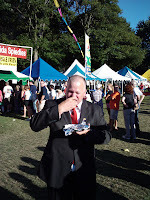 I had the pleasure of following Gary during his recent appearance at Spiedie Fest in Binghamton, New York, and i have pictures and stories about the experience, but first I'd like to get you up to speed about who Gary Berntsen is and what his platform is. 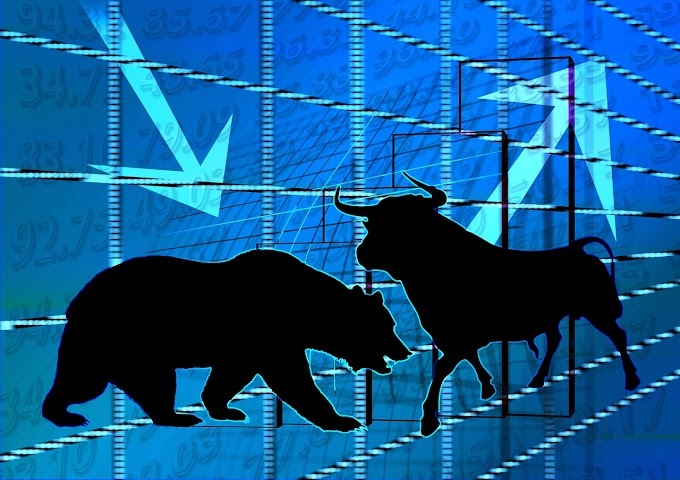 Gary Berntsen is a former CIA officer and best selling author. He served in the Air Force, and spent 23 years with the CIA's Clandestine Service, and as a CIA Station Chief three times. He is also the author of three books including the New York Times bestseller Jawbreaker: the Attack on Bin Laden and al Qaeda. He is best known for having led the CIA 's paramilitary forces in eastern Afghanistan against Osama bin Laden and al Qaeda in response to the September 11, 2001 attack. In Afghanistan he led the capture of Kabul and was the architect of the battle of Tora Bora. Gary led CIA teams in East Africa after the August 1998 bombings of the U.S. Embassies in Nairobi, Kenya and Dar 'es Salaam, Tanzania. In the late 1990 's he was the Chief of Hezbollah Operations in CIA 's Counter-terrorism Center. From 2002 to 2005 he managed major Counter-narcotics Programs in Latin America. Gary is one of CIA 's most highly decorated officers having received CIA 's Distinguished Intelligence Medal and CIA 's Intelligence Star. He retired from CIA in 2005. As you can see Gary is a hard working man who has served his country with honor and distinction. 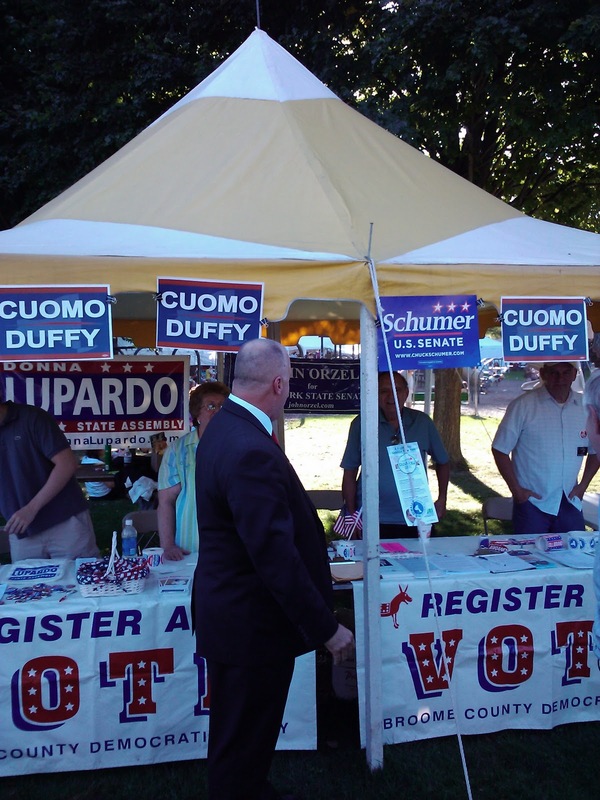 If his appearance at Spiedie Fest is any indication of the energy and passion he will bring to the Senate, than he is far and away the best man for the job. After spending the day in Albany, Gary and his crew rushed to get to Binghamton. He arrived in time to speak to local Fox News affiliate Fox 40 WICZ. He spent some time talking to Congressional candidate George Phillips and met with interested citizens and talked with them all about what his plans were when he is elected. Gary headed off to tour the festival and meet with some of the other like minded groups there. 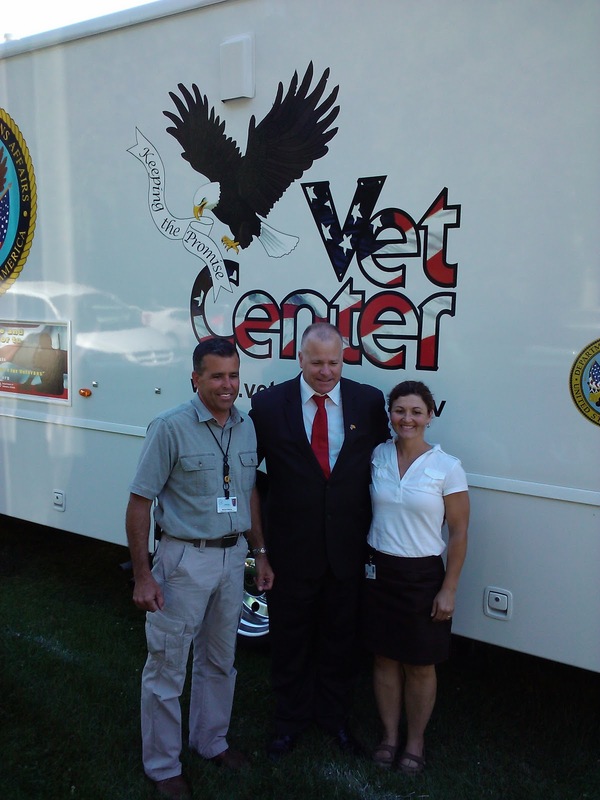 His first stop was the Veterans Administration trailer. He spoke with the folks there and took some time for a photo opp with a couple of their representatives. He was gracious and attentive to what they had to say, and overall enthusiastic about talking with the Veterans on hand. His energy level was amazing and he never slowed down. son who is in the Air Force serving in Afghanistan. 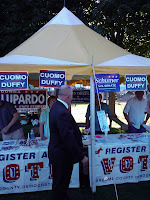 After leaving the Hope Tent Gary sprinted across the fair grounds and stopped for a meet and greet with the Democrats at their tent. The look of amazement on their faces showed they were not at all expecting such a visit. 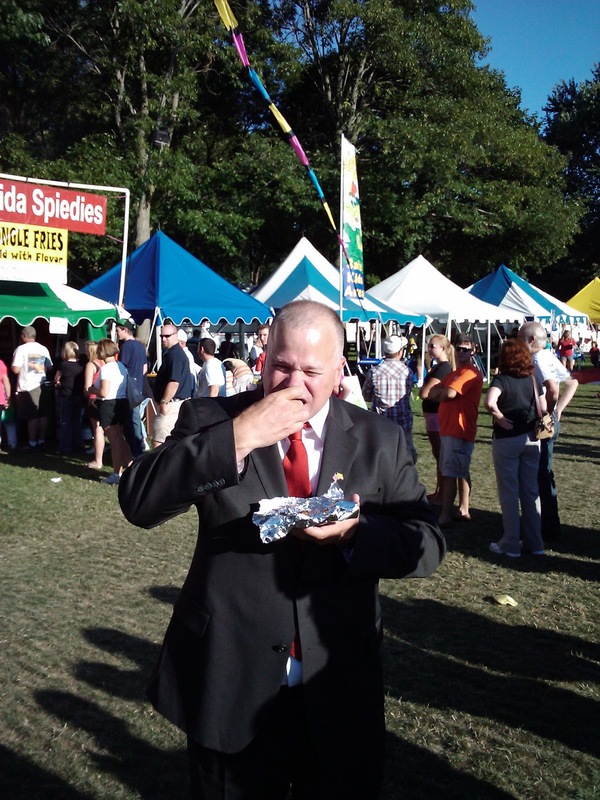 Berntsen along with his two aides, George Phillips and his assistant Rebecca O'Brien had a traditional upstate specialty, a spiedie. Gary Stopped for another photo opp in front of the Salamida's inflatable spiedie sauce bottle display. 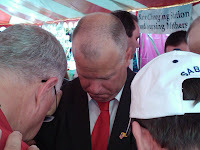 After enjoying some food Berntsen headed back to the George Phillips tent and talked some more with the other candidates on hand, and chatted with local residents as well. I got a short interview which I filmed. (I will include it in an edit to this article later once I have had the time to clean up the audio and edit it properly.) 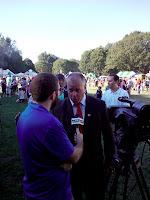 I left the Spiedie Fest around 7-7:30 and Gary was still there taking time to talk with anyone who would listen. Overall I was very impressed with Gary Berntsen and his message. I think he will make a great Senator, and I look forward to election day. Is it true that Bernsten has never voted in New York State? I would imagine that it is pretty difficult to vote in NY when you're a station chief in Napal or South America, or when you're hunting down the bombers of the US Embassy attacks in Africa, or when you're hunting bin Laden in Afghanistan. 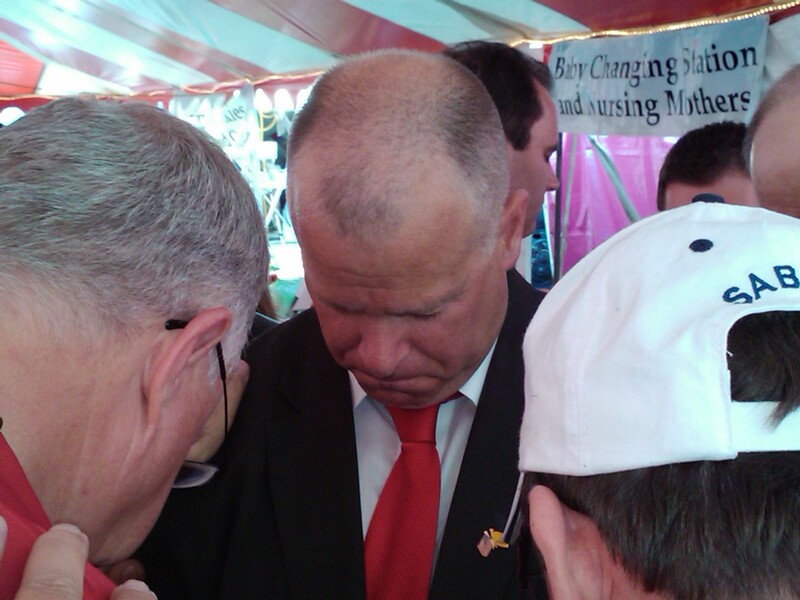 I have met with and spoken to Gary Berntsen at length. He is filled with a patriotic spirit that is too often lacking in our so-called "leaders" in Washington. Gary is well educated and informed on the issues and views public policy decisions through the prism of the best interests of the people. He is honest and forthcoming with his positions, and he makes no apology for standing against "politics as usual." Gary is a man of honor and integrity whose character harkens back to the days of our founders when virtue overcame the temptations of corruption. Gary Berntsen has proven that his politics are not for sale, and he is just what New Yorkers need to shake up Washington. If you have had enough of the out of control spending and corruption of Schumer and the DC elite, Gary Berntsen is the candidate you can support with confidence. I believe in the American Republic. I believe in Almighty God, and that what we do in this life shall echo in eternity. I believe we all have a responsibility to preserve and protect the US Constitution and preserve the blessings of liberty for our children. I believe in smaller and smarter government, and of a rule of law that respects the rights of individuals. In a sense, I am an idealistic person, but I also understand the realities we face and know that tough decisions must be made. I am voting for Gary Berntsen because he represents my views best. 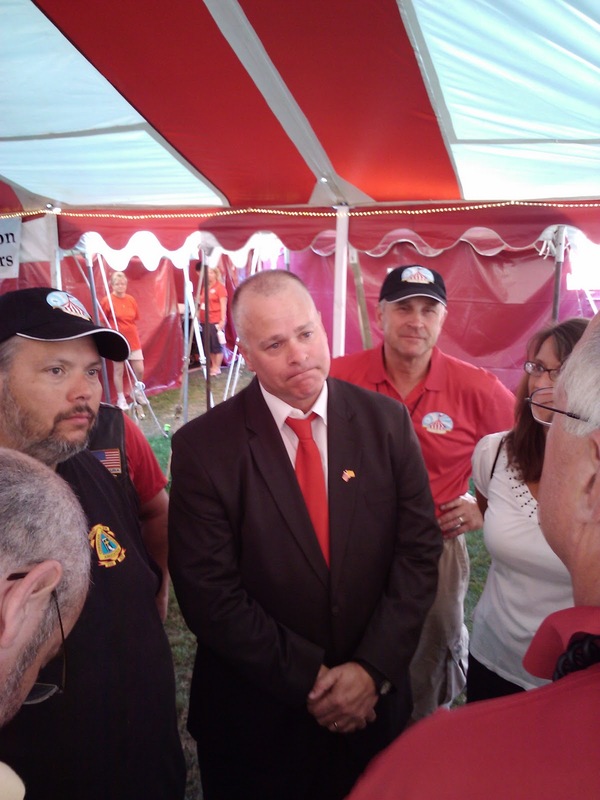 I am voting for Gary Berntsen because he offers a choice that is compatable with my conscience. It has been too long since the people could claim that. 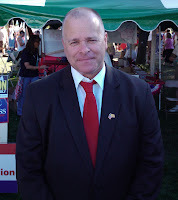 My name is Rich Burns, I am from Long Island, and I proudly support Gary Berntsen for the United States Senate.